I do not believe the warming is due to methane clathrates. If that were true, it would be huge news. Do I need to do this? I don’t know. I didn't mean you or any particular person needs to do this; I'm not trying to boss people around. I meant that "we", whoever is interested in working with me on the El Niño project, need to look at the data and form some hypotheses. Comment Source:I do not believe the warming is due to methane clathrates. If that _were_ true, it would be huge news. > Do I need to do this? I don’t know. I didn't mean you or any particular person needs to do this; I'm not trying to boss people around. I meant that "we", whoever is interested in working with me on the El Ni&ntilde;o project, need to look at the data and form some hypotheses. what source for that spacial anomaly in the temperature anomalies could then this else be ? Maybe not clathrates solely, but e.g. also other forms of methane leakage, but I currently can't come up with much other reasons. In particular the heat spot is rather constant in the images, it doesn't look like a bug (but I haven't yet scrutinized enough images). do you have any ideas ? Oil platforms? The methane rates in the Barents sea are constantly rising, here an overview by Leonid Yurganov. "Large fluid leakage structures occurs in SW Barents Sea and shows links to the major tectonic setting. The glacial periods (uplift and erosion) have caused fluid leakage from deep reservoirs. In many locations, fluid leakage results in accumulations of shallow gas and gas hydrates that are relatively stable in structures containing thermogenic hydrocarbons. But gas hydrate stability varies widely throughout the SW Barents Sea. Possible gas hydrate occurrences in many parts of the SW Barents Sea can be sensitive to changes in ocean temperature due to global warming. This can then lead to melting of large quantities of gas hydrates in the upper 100 m below the seabed over a relatively short period (100-200 years)." I don't know how this exactly may lead to those temperature anomalies, but either the involved gas is warmer than the sea (?) and/or something is burning (where I have not found reports about burning clathrates in the Barents sea) and/or the warming potential of methane is vastly bigger than thought (where this sounds on a first look too vast to be true), or eventually this is due to oil/gas drilling - all these are at least possible explanations. The complicated tectonics could also point to some kind of underwater "volcanos" with eventually even lava leakages ?? this is not necessarily only a question of "being interested", not everybody has the time to "work with you" without pay, and this is not really a "recreational occupation". I think someone should be concerned with this and while looking at all this I find it seems that there is not enough interest in the involved topics as there should be. Like how many independent complete global methane measurements had been performed in the world since the eighties? I know of one ! (that by NOAA, mainly by Ed Dlugokensky). if this is true and there is really only one such measurement then pardon me?!!!! Fate of mankind may depend on this! It kind of seems that everybody of the 6 billion people on earth thinks (falsely) that there are already enough people who care about this, at least that's my current impression - last but not least I was myself shocked to learn that there are just that few measurements for such an important quantity. Comment Source:>I do not believe the warming is due to methane clathrates. If that were true, it would be huge news. what source for that spacial anomaly in the temperature anomalies could then this else be ? Maybe not clathrates solely, but e.g. also other forms of methane leakage, but I currently can't come up with much other reasons. In particular the heat spot is rather constant in the images, it doesn't look like a bug (but I haven't yet scrutinized enough images). do you have any ideas ? Oil platforms? The methane rates in the Barents sea are constantly rising, <a href="http://arctic-news.blogspot.de/2013/02/overview-of-iasi-methane-levels.html">here</a> an overview by Leonid Yurganov. In the doctoral thesis by Sunil Vadakkepuliyambatta this may at least in part be due to tectonic settings (where I am not sure wether this is about real <a href="http://en.wikipedia.org/wiki/Tectonics">tectonics</a> (like in the <a href="http://en.wikipedia.org/wiki/Methane_clathrate#Natural_deposits">lithossphere</a>) or some special type of ice tectonics: >"Large fluid leakage structures occurs in SW Barents Sea and shows links to the major tectonic setting. The glacial periods (uplift and erosion) have caused fluid leakage from deep reservoirs. In many locations, fluid leakage results in accumulations of shallow gas and gas hydrates that are relatively stable in structures containing thermogenic hydrocarbons. But gas hydrate stability varies widely throughout the SW Barents Sea. Possible gas hydrate occurrences in many parts of the SW Barents Sea can be sensitive to changes in ocean temperature due to global warming. This can then lead to melting of large quantities of gas hydrates in the upper 100 m below the seabed over a relatively short period (100-200 years)." I don't know how this exactly may lead to those temperature anomalies, but either the involved gas is warmer than the sea (?) and/or something is burning (where I have not found reports about burning clathrates in the Barents sea) and/or the warming potential of methane is vastly bigger than thought (where this sounds on a first look too vast to be true), or eventually this is due to oil/gas drilling - all these are at least possible explanations. The complicated tectonics could also point to some kind of underwater "volcanos" with eventually even lava leakages ?? > I meant that “we”, whoever is interested in working this is not necessarily only a question of "being interested", not everybody has the time to "work with you" without pay, and this is not really a "recreational occupation". >I didn’t mean you or any particular person needs to do this I think someone should be concerned with this and while looking at all this I find it seems that there is not enough interest in the involved topics as there should be. Like how many independent complete global methane measurements had been performed in the world since the eighties? I know of one ! (that by NOAA, mainly by Ed Dlugokensky). if this is true and there is really only one such measurement then pardon me?!!!! Fate of mankind may depend on this! It kind of seems that everybody of the 6 billion people on earth thinks (falsely) that there are already enough people who care about this, at least that's my current impression - last but not least I was myself shocked to learn that there are just that few measurements for such an important quantity. what source for that spacial anomaly in the temperature anomalies could then this else be? Maybe the ice albedo effect? Warming is accelerated in the Arctic by the fact that when ice begins to melt, it becomes darker in color, leading to a feedback called the ice albedo effect. Lots of people agree that the Arctic is warming much faster than the rest of the Earth and the amount of Arctic sea ice is rapidly decreasing. I'd need to dig into some technical papers to see if people believe they explain this. Yes, it's worrisome. I believe the Arctic Methane Emergency Group contacted Obama about this general issue, but there should be more research. this is not necessarily only a question of “being interested”, not everybody has the time to “work with you” without pay, and this is not really a “recreational occupation”. I understand, especially since you keep saying this. By "interested in working" I meant "willing and able to work"; the word "interested" has an ambiguous meaning. Comment Source:> what source for that spacial anomaly in the temperature anomalies could then this else be? Maybe the ice albedo effect? Warming is accelerated in the Arctic by the fact that when ice begins to melt, it becomes darker in color, leading to a feedback called the ice albedo effect. Lots of people agree that the Arctic is warming [much faster than the rest of the Earth](http://earthobservatory.nasa.gov/Features/ArcticIce/arctic_ice3.php) and the amount of Arctic sea ice is rapidly decreasing. I'd need to dig into some technical papers to see if people believe they explain this. > I know of one ! (that by NOAA, mainly by Ed Dlugokensky). if this is true and there is really only one such measurement then pardon me?!!!! Fate of mankind may depend on this! Yes, it's worrisome. I believe the [Arctic Methane Emergency Group](http://ameg.me/) contacted Obama about this general issue, but there should be more research. > this is not necessarily only a question of “being interested”, not everybody has the time to “work with you” without pay, and this is not really a “recreational occupation”. I understand, especially since you keep saying this. By "interested in working" I meant "willing and able to work"; the word "interested" has an ambiguous meaning. Maybe it has something to do with the ice. That is in particular I don't know how the SST is determined if there is ice, wether they drill holes or wether not. Is the Barent sea closed by ice in January? I would think yes, but may be not. In this book "Ecosystem Barents Sea herausgegeben von Egil Sakshaug,Geir Helge Johnsen,Kit M. Kovacs", which can be found on google and which I can't link to in this editor without replacing about eventually 20 wrong html commands on page 40 image 2.6 it is described that "a typical feature of the Barents sea is that the south-western parts are covered with warm Atlantic and coastal waters, while the northeastern parts are occupied by colder arctic and locally formed water masses. The border between the Atlantic and Arctic water masses is called the Polar front. During winter the ice edge usually follows this front. So this book seems to indicate that that warm spot is a "basin of warm Atlantic water". But why then is the Atlantic west of that spot cold? I understand, especially since you keep saying this. Yes, last but not least I keep saying this, because I have the impression that this topic is somewhat underrepresented in the discussions here. Comment Source:I have now looked at all January images here: <a href="http://www.ospo.noaa.gov/Products/ocean/sst/anomaly/index.html">http://www.ospo.noaa.gov/Products/ocean/sst/anomaly/index.html</a> they ALL contain a red spot inthe Barents sea If I haven't overseen something then 2008 was first were the spot was extending behind the Svalbard, but quite some of the earlier images seem to contain no measurements for that region: <img src = "http://www.ospo.noaa.gov/data/sst/anomaly/2008/anomnight.1.3.2008.gif" alt = ""/> >Maybe the ice albedo effect? Warming is accelerated in the Arctic by the fact that when ice begins to melt, it becomes darker in color, leading to a feedback called the ice albedo effect. Maybe it has something to do with the ice. That is in particular I don't know how the SST is determined if there is ice, wether they drill holes or wether not. Is the Barent sea closed by ice in January? I would think yes, but may be not. In this book "Ecosystem Barents Sea herausgegeben von Egil Sakshaug,Geir Helge Johnsen,Kit M. Kovacs", which can be found on google and which I can't link to in this editor without replacing about eventually 20 wrong html commands on page 40 image 2.6 it is described that <em>"a typical feature of the Barents sea is that the south-western parts are covered with warm Atlantic and coastal waters, while the northeastern parts are occupied by colder arctic and locally formed water masses. The border between the Atlantic and Arctic water masses is called the Polar front. During winter the ice edge usually follows this front.</em> So this book seems to indicate that that warm spot is a "basin of warm Atlantic water". But why then is the Atlantic west of that spot cold? >I understand, especially since you keep saying this. Yes, last but not least I keep saying this, because I have the impression that this topic is somewhat underrepresented in the discussions here. I suspect the whole Arctic Sea is hot, but it looks like there's a Barents hot spot because that's where there happens to be open ocean. Most of the rest of the Arctic is white, meaning the sea surface is obscured by ice. As John notes, this is likely just polar amplification (enhanced high-latitude warming). The causes of polar amplification appear to be complex. I went to an AGU session on this a few years ago, and was surprised that there were still a number of competing explanations, with little apparent cross-dialogue between proponents of different hypotheses. Some of those hypotheses include surface albedo feedback (from melting sea ice, land ice, or snow), changing cloud feedback, and alterations in poleward heat transport of the atmosphere-ocean circulation. Comment Source:I suspect the whole Arctic Sea is hot, but it looks like there's a Barents hot spot because that's where there happens to be open ocean. Most of the rest of the Arctic is white, meaning the sea surface is obscured by ice. As John notes, this is likely just polar amplification (enhanced high-latitude warming). The causes of polar amplification appear to be complex. I went to an AGU session on this a few years ago, and was surprised that there were still a number of competing explanations, with little apparent cross-dialogue between proponents of different hypotheses. Some of those hypotheses include surface albedo feedback (from melting sea ice, land ice, or snow), changing cloud feedback, and alterations in poleward heat transport of the atmosphere-ocean circulation. I went to an AGU session on this a few years ago, and was surprised that there were still a number of competing explanations, with little apparent cross-dialogue between proponents of different hypotheses. Interesting. Was there someone who calculated wether there is a solar irradiation difference between northern and southern hemissphere? I suspect the whole Arctic Sea is hot, but it looks like there’s a Barents hot spot because that’s where there happens to be open ocean. So this spot seems to be surrounded by cold waters (or ice or land). This points way more to some hot stuff coming from the seabad, like gas or even lava than some latitude dependent feature. Comment Source:>I went to an AGU session on this a few years ago, and was surprised that there were still a number of competing explanations, with little apparent cross-dialogue between proponents of different hypotheses. Interesting. Was there someone who calculated wether there is a solar irradiation difference between northern and southern hemissphere? >I suspect the whole Arctic Sea is hot, but it looks like there’s a Barents hot spot because that’s where there happens to be open ocean. No this spot seems to be very localized and it is basically always there (I haven't found any image where there is no norvegian front-hot spot , in particular here you can see that right east of it in front of Novaya semlya the water is also cold, this is not always the case but fairly often: <img src = "http://www.ospo.noaa.gov/data/sst/anomaly/2011/anomnight.8.1.2011.gif" alt = ""/> So this spot seems to be surrounded by cold waters (or ice or land). this "cold" region in front of Novaya semlya is also ice free in January: <img src="http://www.ospo.noaa.gov/data/sst/anomaly/2011/anomnight.1.3.2011.gif" alt = ""/> Sunil Vadakkepuliyambatta talked about tectonics in relation to methane leakages, I haven't seen his thesis but in fact there seem to be some tectonic faults at what looks like as being exactly at that spot: <img src="http://en.wikipedia.org/wiki/Tectonics#mediaviewer/File:Plate_tectonics_map.gif" alt = ""/> which are decribed in this document on Wikipedia as: <em>Major active fault or fault zone, where nature, location or activity are unknown</em> (side remark: It actually looks as if this fault could be part of a fault which is a break between the western europe/African plate and the Eurasian/Arabian plate) This points way more to some hot stuff coming from the seabad, like gas or even lava than some latitude dependent feature. I can't imagine there's any hemispheric difference in top-of-atmosphere solar irradiation, but there can be a difference in surface insolation due to cloud albedo. Also, I don't really see how clathrate dissociation could significantly warm the regional surface waters. I'm not sure what's going on here. However, this blog post suggests it could be an artifact of the NOAA/NESDID SST anomaly data product (see also here). Comment Source:I can't imagine there's any hemispheric difference in top-of-atmosphere solar irradiation, but there can be a difference in surface insolation due to cloud albedo. Also, I don't really see how clathrate dissociation could significantly warm the regional surface waters. I'm not sure what's going on here. However, this [blog post](http://bobtisdale.wordpress.com/2009/03/10/the-barents-sea-hotspot-isn%E2%80%99t-so-hot/) suggests it could be an artifact of the NOAA/NESDID SST anomaly data product (see also [here](http://bobtisdale.blogspot.com/2009/09/note-about-sst-anomaly-maps.html)). Many thanks for the very interesting links. I’m not sure what’s going on here. However, this blog post suggests it could be an artifact of the NOAA/NESDID SST anomaly data product (see also here). What I understand from both posts is that the above NOAA images are created from NOAA/NESDIS data, which doesn't include the buoy measurements, but only satellite data. What follows from the blog posts is that the hot spot -if at all- is mostly only that strongly visible in the NESDIS satellite data and not in the olv2 anomaly data, which includes buoy measurements. The finegradedness changes there also from 16 quantization steps down to 9, which is only half of that of the NESDIS. The NESDIS displays anomaly differences of around 5 degrees between the hot spot and the cold spots next to it. A global scale could make those differences smaller and less visible in a coarse quantisation. So concluding it seems there are some artifacts, especially in the olv2 data, but these may be mostly due to the mapping (like the finegradedness, moreover in a comment in here it was remarked that some (scaling?) labels in the dataset where inconsistent). Overall the hot spot seems still to be there in the images (especially in winter). Apart from the mapping differences I could however also imagine that there are real differences also in the datasets. That however would point to some old suspicion of me, that there is something strange with the assesment of the global warming potential of methane. Also, I don’t really see how clathrate dissociation could significantly warm the regional surface waters. That is if there are "considerably cold " methane leakages (like the olv2 data set and you seems to suggest) then due a high global warming potential (and as the NESDIS data suggests this looks ("this is just very speculative statement though) much higher then as the official values would suggest) the daytime satellite data could reveal much higher temperature values due to methane. But I don't know how the clouds and the methane rising up into the stratosphere would influence the satellite data. I can’t imagine there’s any hemispheric difference in top-of-atmosphere solar irradiation, but there can be a difference in surface insolation due to cloud albedo. Yes I think there is quite certainly a difference in surface insolation due to cloud albedo. I am not sure but due to the ellipticity of the earth orbit around the sun I could though also imagine that there could be differences in solar irradiation for the two hemisspheres. I was even almost at the point to try to do the calculations myself, but then I was missing data about the actual orbit (like exact ellipticity etc.) and apart from this this is really tedious work, moreover there should be tons of similar calculations somewhere, which I just sofar haven't found. Comment Source:Many thanks for the very interesting links. >I’m not sure what’s going on here. However, this blog post suggests it could be an artifact of the NOAA/NESDID SST anomaly data product (see also here). What I understand from both posts is that the above NOAA images are created from NOAA/NESDIS data, which doesn't include the buoy measurements, but only satellite data. What follows from the blog posts is that the hot spot -if at all- is mostly only that strongly visible in the NESDIS satellite data and not in the olv2 anomaly data, which includes buoy measurements. The blog author found that the olv2 anomaly data displays a very cold peak in Aug 2008 for the Barents Sea, which seems not visible in the NESDIS data, however I find the peak (around Aug 25) seems also somewhat visible in the NOAA data if one compares those two images (and the following to Aug 25): <img src="http://www.ospo.noaa.gov/data/sst/anomaly/2008/anomnight.8.21.2008.gif" alt=" " /> <img src="http://www.ospo.noaa.gov/data/sst/anomaly/2008/anomnight.8.25.2008.gif" alt=" " /> Moreover there seems to be a scale problem with the olv2 anomaly data though if you compare e.g. 04 Aug 1999 with Aug 2003: HERE WAS AN EMBEDDING WHICH WAS NOT SWALLOWED BY THE HTML The finegradedness changes there also from 16 quantization steps down to 9, which is only half of that of the NESDIS. The NESDIS displays anomaly differences of around 5 degrees between the hot spot and the cold spots next to it. A global scale could make those differences smaller and less visible in a coarse quantisation. Anyways but still even the the olv2 data reveals a kind of hot spot, if one looks at the january data: HERE WAS AN EMBEDDING WHICH WAS NOT SWALLOWED BY THE HTML So concluding it seems there are some artifacts, especially in the olv2 data, but these may be mostly due to the mapping (like the finegradedness, moreover in a comment in <a href="http://bobtisdale.blogspot.de/2009/09/note-about-sst-anomaly-maps.html">here</a> it was remarked that some (scaling?) labels in the dataset where inconsistent). Overall the hot spot seems still to be there in the images (especially in winter). Apart from the mapping differences I could however also imagine that there are real differences also in the datasets. That however would point to some old suspicion of me, that there is something strange with the assesment of the global warming potential of methane. >Also, I don’t really see how clathrate dissociation could significantly warm the regional surface waters. That is if there are "considerably cold " methane leakages (like the olv2 data set and you seems to suggest) then due a high global warming potential (and as the NESDIS data suggests this looks ("this is just very speculative statement though) much higher then as the official values would suggest) the daytime satellite data could reveal much higher temperature values due to methane. But I don't know how the clouds and the methane rising up into the stratosphere would influence the satellite data. >I can’t imagine there’s any hemispheric difference in top-of-atmosphere solar irradiation, but there can be a difference in surface insolation due to cloud albedo. Yes I think there is quite certainly a difference in surface insolation due to cloud albedo. I am not sure but due to the ellipticity of the earth orbit around the sun I could though also imagine that there could be differences in solar irradiation for the two hemisspheres. I was even almost at the point to try to do the calculations myself, but then I was missing data about the actual orbit (like exact ellipticity etc.) and apart from this this is really tedious work, moreover there should be tons of similar calculations somewhere, which I just sofar haven't found. I'd like to dump some abstracts of ENSO papers onto the Forum and maybe later the wiki. Minimal references here, but links. If any of you want more information on any particular one of these, let me know. Periodic Forcing and ENSO Suppression in the Cane-Zebiak Model. Abstract. The effect of a periodic forcing on the intensity of El Nino-Southern Oscillation (ENSO) is studied using the Cane-Zebiak model. With a basic seasonal climate close to the present, ENSO can be suppressed by a substantially enhanced seasonal external equatorial wind, which could be induced by monsoon forcing. ENSO suppression is usually more effective for an unstable self-exciting ENSO than for a stable stochastic-exciting ENSO. In addition, ENSO also tends to be suppressed by sufficiently strong periodic forcings of longer periods. The suppression of ENSO seems to be related to the nonlinear mechanism of frequency entrainment. These conclusions are in qualitative agreement with previous studies of conceptual ENSO models, although the Cane-Zebiak model shows a much more complicated dependence of the amplitude of ENSO on periodic forcing. The Zebiak-Cane model is one of those models I'm hoping someone can implement on a browser! We have material about it on the page ENSO. Comment Source:I'd like to dump some abstracts of ENSO papers onto the Forum and maybe later the wiki. Minimal references here, but links. If any of you want more information on any particular one of these, let me know. * [Periodic Forcing and ENSO Suppression in the Cane-Zebiak Model](http://link.springer.com/article/10.1007/s10872-005-0023-5). **Abstract. ** The effect of a periodic forcing on the intensity of El Nino-Southern Oscillation (ENSO) is studied using the Cane-Zebiak model. With a basic seasonal climate close to the present, ENSO can be suppressed by a substantially enhanced seasonal external equatorial wind, which could be induced by monsoon forcing. ENSO suppression is usually more effective for an unstable self-exciting ENSO than for a stable stochastic-exciting ENSO. In addition, ENSO also tends to be suppressed by sufficiently strong periodic forcings of longer periods. The suppression of ENSO seems to be related to the nonlinear mechanism of frequency entrainment. These conclusions are in qualitative agreement with previous studies of conceptual ENSO models, although the Cane-Zebiak model shows a much more complicated dependence of the amplitude of ENSO on periodic forcing. The Zebiak-Cane model is one of those models I'm hoping someone can implement on a browser! We have material about it on the page [[ENSO]]. Impact of quasi-decadal variability in the tropical Pacific on ENSO modulations. Abstract The impact of quasi-decadal (QD: 8 to 18 years) variability in the tropical Pacific on ENSO events is investigated. It is found that there is a significant difference in the behavior of ENSO events between the phases of positive and negative anomalies of the QD Niño-3.4 index. During the period of negative QD-scale Niño-3.4 index, ENSO events, especially La Niña events, occur more frequently, and larger amplitudes of thermal anomalies related to El Niño events appear over the central to eastern equatorial Pacific. Furthermore, propagations of upper ocean heat content anomaly and a phase relationship between upper ocean heat content and Niño-3 index in the equatorial Pacific, which have been pointed out by previous studies, are clearly detected during the period of negative QD Niño-3.4 index. Comment Source:* [Impact of quasi-decadal variability in the tropical Pacific on ENSO modulations](http://link.springer.com/article/10.1007/s10872-006-0047-5). **Abstract** The impact of quasi-decadal (QD: 8 to 18 years) variability in the tropical Pacific on ENSO events is investigated. It is found that there is a significant difference in the behavior of ENSO events between the phases of positive and negative anomalies of the QD Niño-3.4 index. During the period of negative QD-scale Niño-3.4 index, ENSO events, especially La Niña events, occur more frequently, and larger amplitudes of thermal anomalies related to El Niño events appear over the central to eastern equatorial Pacific. Furthermore, propagations of upper ocean heat content anomaly and a phase relationship between upper ocean heat content and Niño-3 index in the equatorial Pacific, which have been pointed out by previous studies, are clearly detected during the period of negative QD Niño-3.4 index. On the 60-month cycle of multivariate ENSO index. Abstract. Many point indices have been developed to describe El Niño/Southern Oscillation, but the multivariate El Niño Southern Oscillation (ENSO) index (MEI) is considered the most representative since it links six different meteorological parameters measured over the tropical Pacific. 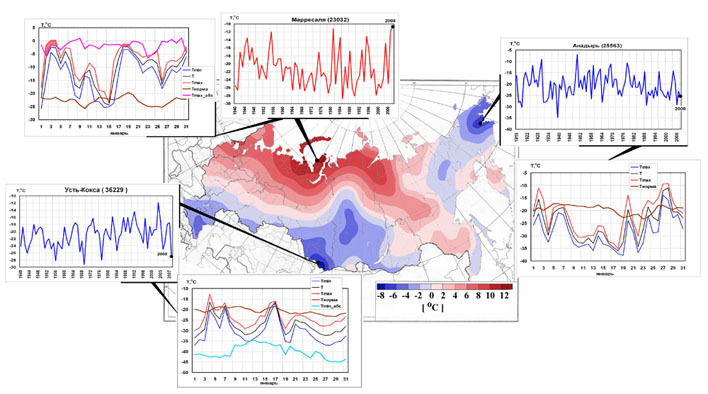 Spectral analysis with appropriate data reduction techniques of monthly values of MEI (1950–2008) has allowed the identification of a large 60-month cycle, statistically confident at a level larger than 99%. The highest values of MEI (typical of El Niño events) and the lowest values of MEI (typical of La Niña events) are concordant with respective maxima and minima values of the identified 60-month cycle. Comment Source:* [On the 60-month cycle of multivariate ENSO index](http://link.springer.com/article/10.1007/s00704-009-0159-0). **Abstract. ** Many point indices have been developed to describe El Niño/Southern Oscillation, but the multivariate El Niño Southern Oscillation (ENSO) index (MEI) is considered the most representative since it links six different meteorological parameters measured over the tropical Pacific. Spectral analysis with appropriate data reduction techniques of monthly values of MEI (1950–2008) has allowed the identification of a large 60-month cycle, statistically confident at a level larger than 99%. The highest values of MEI (typical of El Niño events) and the lowest values of MEI (typical of La Niña events) are concordant with respective maxima and minima values of the identified 60-month cycle. A new approach to studying ENSO predictability: Conditional nonlinear optimal perturbation. Abstract. A new approach, the conditional nonlinear optimal perturbation (CNOP) is introduced to study the predictability of El Niño-Southern Oscillation (ENSO) using a theoretical coupled ocean-atmosphere model. The differences between CNOP and linear singular vector (LSV) are demonstrated. The results suggest that the nonlinear model and CNOP are superior in determining error growth for studying predictability of the ENSO. In particular, the CNOP approach is used to explore the nature of the ‘spring predictability barrier’ in ENSO prediction. Comment Source:* [A new approach to studying ENSO predictability: Conditional nonlinear optimal perturbation](http://link.springer.com/article/10.1007/BF03184224). **Abstract. ** A new approach, the conditional nonlinear optimal perturbation (CNOP) is introduced to study the predictability of El Niño-Southern Oscillation (ENSO) using a theoretical coupled ocean-atmosphere model. The differences between CNOP and linear singular vector (LSV) are demonstrated. The results suggest that the nonlinear model and CNOP are superior in determining error growth for studying predictability of the ENSO. In particular, the CNOP approach is used to explore the nature of the ‘spring predictability barrier’ in ENSO prediction. The Zebiak-Cane model is one of those models I’m hoping someone can implement on a browser! Cannot suppress the urge to raise my hand. John the actual panel is at the end of the browser page. The noise in this one is actually generated and used to solve the diff EQ in the browser. In the newly released Mathematica 10 we have large collection of new solvers and geometric boundary (grids) as a part of the domain for solving the equations. I’d like to dump some abstracts of ENSO papers onto the Forum and maybe later the wiki. Minimal references here, but links. If any of you want more information on any particular one of these, let me know. which hold the Siberian sinkholes, suggests that those Siberian sinkholes are related to the tectonics, which were pointed out by Sunil Vadakkepuliyambatta. Anyways, Nathan, I was sort of searching for decent air temperature recordings which are similar to that SST images (for getting a feeling for the global warming potential of methane) but I haven't found anything (lookable, readable). The HADCRUT has a Gridded Google earth view with temperature anomalies, thats interesting but not quite the same. Like one e.g has to click on each checker board grid for getting data etc.If you know about something in that sense that would be interesting. There exists a NetCDF file, which one could use for a visualization, but extracting that would be a lot of work (without pay). By the way while looking at that temperature data I noticed that there are some stations who terminated service (some after almost around hundred years of service) like in Iraq, which seems to be due to the war. But what happened to the station in Kuwait? Since Kuwait is economically well off, what are the reasons for ceasing reporting? Comment Source:>I’d like to dump some abstracts of ENSO papers onto the Forum and maybe later the wiki. Minimal references here, but links. If any of you want more information on any particular one of these, let me know. John, Why don't you dump a link to your methane sinkhole Google Plus post as well? Because of the nasty HTML escapes? https://plus.google.com/117663015413546257905/posts/9SxJJFRLKe1 I don't know anything about tectonical faults and their corresponding phenomena like lava or methane crates etc. But the higher occurrence of pingos in Yukon and Northwest Territories of Canada, which are closed to "volcanic centers active in the last one million years generalized. Minor basaltic centers and seamounts omitted" and "Reverse fault (overthrust subduction zone) generalized, barbs on upthrown side", as given in the Wikipedia tectonics image: http://en.wikipedia.org/wiki/Tectonics#mediaviewer/File:Plate_tectonics_map.gif and the fact that there seems to be faults according to the Wikipedia image, which were already mentioned above: >which are decribed in this document on Wikipedia as: Major active fault or fault zone, where nature, location or activity are unknown (side remark: It actually looks as if this fault could be part of a fault which is a break between the western europe/African plate and the Eurasian/Arabian plate) which lead exactly to the http://en.wikipedia.org/wiki/Tazovsky_District and the http://en.wikipedia.org/wiki/Yamal_Peninsula which hold the Siberian sinkholes, suggests that those Siberian sinkholes are related to the tectonics, which were pointed out by Sunil Vadakkepuliyambatta. Anyways, Nathan, I was sort of searching for decent air temperature recordings which are similar to that SST images (for getting a feeling for the global warming potential of methane) but I haven't found anything (lookable, readable). The HADCRUT has a Gridded Google earth view with temperature anomalies, thats interesting but not quite the same. Like one e.g has to click on each checker board grid for getting data etc.If you know about something in that sense that would be interesting. There exists a NetCDF file, which one could use for a visualization, but extracting that would be a lot of work (without pay). By the way while looking at that temperature data I noticed that there are some stations who terminated service (some after almost around hundred years of service) like in Iraq, which seems to be due to the war. But what happened to the station in Kuwait? Since Kuwait is economically well off, what are the reasons for ceasing reporting? By the way links to articles about that break are welcome, also in russian - that is I guess especially the russians could be especially interested in determining wether their country brakes apart. Comment Source:>It actually looks as if this fault could be part of a fault which is a break between the western europe/African plate and the Eurasian/Arabian plate By the way links to articles about that break are welcome, also in russian - that is I guess especially the russians could be especially interested in determining wether their country brakes apart. Гидролакколиты (от др.-греч. ὕδωρ + λάκκος + λίθος — «Вода + яма, углубление + камень») — масса подпочвенного льда, по форме сходные с лакколитами. By the way speaking of Pingos as in Yukon/North West Territories like in the Mac Kenzie Delta and Methane - there had even been Hydrates turned into Gas amongst others by the MH21 Consortium. Comment Source:My Magma guesses seem not so far off in particular the russian Wikipedia https://ru.wikipedia.org/wiki/%D0%91%D1%83%D0%B3%D1%80%D1%8B_%D0%BF%D1%83%D1%87%D0%B5%D0%BD%D0%B8%D1%8F calls Pingos: >Гидролакколиты (от др.-греч. ὕδωρ + λάκκος + λίθος — «Вода + яма, углубление + камень») — масса подпочвенного льда, по форме сходные с лакколитами. (where reference  is in the book: Гидролакколиты. Горная энциклопедия, 1986.- М.: Советская энциклопедия. — Т. 2. — С. 48.) So literally a Pingo is called: "Hydro-<a href="https://en.wikipedia.org/wiki/Laccolith">Laccolith</a>" (as it seems also to be the case sometimes in english) By the way speaking of Pingos as in Yukon/North West Territories like in the Mac Kenzie Delta and Methane - there had even been <a href="http://www.mh21japan.gr.jp/english/mh21-1/3-2/">Hydrates turned into Gas</a> amongst others by the MH21 Consortium. I don't know of a global gridded surface air temperature product that is easily web-browse-able. I don't know why some surface stations have been terminated. In general, I think the U.S. and Europe have been shutting down stations because they feel their meteorological network is oversampled and not worth the expense to maintain all of them. I suspect the Middle Eastern network is not as dense, so their reasons may be different. Comment Source:I don't know of a global gridded surface air temperature product that is easily web-browse-able. I don't know why some surface stations have been terminated. In general, I think the U.S. and Europe have been shutting down stations because they feel their meteorological network is oversampled and not worth the expense to maintain all of them. I suspect the Middle Eastern network is not as dense, so their reasons may be different. I don’t know of a global gridded surface air temperature product that is easily web-browse-able. Aha. Thanks. So it seems if there is something then it is rather well hidden. I don’t know why some surface stations have been terminated. In general, I think the U.S. and Europe have been shutting down stations because they feel their meteorological network is oversampled and not worth the expense to maintain all of them. I suspect the Middle Eastern network is not as dense, so their reasons may be different. Oversampled? If I look at the northern siberian region (Tazovsky District, Yamal Peninsula etc.) then on a first glance I see that out of four stations there is only one anymore working (at least until 2012), namely Lesinko. Cape Kharasovoy stopped in 2004, Vilkickogo and Gyda stopped in 2008. Within a time window of 20 years (1988-2008) the temperature anomalies are going up from like June -0.50 to 0.60, July -1.95 to 2.20, August -0.8 to 3.60, September -0.45 to 2.90 etc. ! which looks QUITE different. I know this is no statistically sound argument...but just look at the values - it very much seems that the temperature values in the Gyda region rose rather quite, quite above average. Closing down stations in such a situation seems similar to stop measuring with a clinical thermometer when the fever gets high! Hello? Comment Source:Compare this with the average grid values of the grid around Budapest: >CRUTEM4 47.5N 17.5E grid-box temperature anomaly Please cite: Osborn & Jones (2014) Earth System Science Data (doi:10.5194/essd-6-61-2014) Jones et al. (2012) Journal of Geophysical Research (doi:10.1029/2011JD017139) Missing code: -99.99 Each seasonal mean requires at least 2 out of 3 months to have data Each annual mean requires at least 8 out of 12 months to have data >1988, 3.97, 1.98, -0.93, -0.11, 0.93, -0.20, 1.68, 1.00, 0.05, 0.15, -3.53, 1.68, 2.49, -0.04, 0.83, -1.11, 0.56 1989, 1.52, 3.25, 3.31, 1.20, -0.09, -1.24, 0.76, 0.42, 0.29, 0.70, -1.13, 1.30, 2.15, 1.47, -0.02, -0.05, 0.86 1990, 1.39, 4.57, 3.85, -0.47, 1.28, 0.07, -0.09, 1.52, -1.61, 0.53, 1.03, -0.33, 2.42, 1.56, 0.50, -0.01, 0.98 1991, 1.71, -3.64, 2.28, -1.16, -2.87, -0.11, 1.68, 0.92, 1.27, -1.15, 0.48, -1.53, -0.75, -0.58, 0.83, 0.20, -0.18 1992, 2.73, 2.36, 0.83, 0.59, 0.97, 1.24, 1.71, 5.27, 0.70, -1.06, 1.03, -0.13, 1.18, 0.79, 2.74, 0.22, 1.35 1993, 2.33, -1.83, -0.64, 0.90, 2.87, 0.91, -0.18, 1.10, -0.22, 0.93, -2.97, 1.76, 0.12, 1.04, 0.61, -0.75, 0.41 1994, 4.84, 0.29, 3.63, 0.45, 0.60, 1.14, 3.40, 2.59, 2.21, -1.57, 2.40, 1.50, 2.30, 1.56, 2.38, 1.02, 1.79 1995, 0.97, 4.22, -0.32, 0.87, 0.10, -0.51, 3.03, 0.36, -1.03, 1.62, -1.74, -0.63, 2.23, 0.22, 0.96, -0.38, 0.58 1996, -0.86, -3.62, -3.08, 0.35, 1.28, 1.41, -0.97, 0.22, -3.06, 0.82, 2.58, -2.64, -1.70, -0.48, 0.22, 0.11, -0.63 1997, -0.89, 2.31, 0.77, -2.41, 1.33, 0.97, -0.44, 1.28, 0.35, -1.99, 0.75, 1.88, -0.41, -0.10, 0.60, -0.30, 0.33 1998, 3.46, 4.43, -0.08, 1.73, 0.74, 1.93, 0.96, 1.72, -0.48, 0.79, -1.88, -2.10, 3.26, 0.80, 1.54, -0.52, 0.94 1999, 1.56, -0.16, 2.14, 1.71, 1.07, 0.61, 1.37, 0.30, 2.47, 0.70, -1.16, 0.31, -0.23, 1.64, 0.76, 0.67, 0.91 2000, -0.27, 3.25, 1.34, 3.68, 2.54, 2.56, -0.53, 2.74, 0.00, 2.88, 3.50, 2.03, 1.10, 2.52, 1.59, 2.13, 1.98 2001, 2.01, 2.26, 2.43, -0.16, 2.52, -0.34, 1.37, 2.75, -1.59, 3.27, -0.83, -3.15, 2.10, 1.60, 1.26, 0.28, 0.88 2002, 1.76, 4.46, 2.35, 0.21, 3.03, 2.69, 2.18, 1.47, -0.70, -0.36, 3.20, -0.77, 1.02, 1.87, 2.11, 0.71, 1.63 2003, 0.16, -3.13, 1.21, 0.01, 3.49, 4.61, 2.15, 4.37, 0.21, -2.21, 2.36, 0.65, -1.25, 1.57, 3.71, 0.12, 1.16 2004, -0.48, 1.46, -0.40, 1.28, -0.74, 0.18, 0.49, 1.49, -0.03, 1.65, 1.18, 0.77, 0.54, 0.05, 0.72, 0.94, 0.57 2005, 2.12, -2.77, -1.28, 1.22, 1.25, 1.08, 0.99, -0.49, 1.04, 0.76, -0.42, -0.05, 0.04, 0.40, 0.52, 0.46, 0.29 2006, -2.16, -1.42, -1.34, 1.72, 0.29, 1.40, 3.67, -1.00, 2.11, 2.38, 2.93, 2.70, -1.21, 0.23, 1.36, 2.47, 0.94 2007, 6.32, 4.26, 2.65, 3.11, 2.06, 3.20, 2.52, 1.75, -1.50, -0.58, -0.65, -0.30, 4.43, 2.61, 2.49, -0.91, 1.90 2008, 3.93, 3.27, 1.30, 1.14, 1.70, 2.45, 1.09, 1.49, -0.58, 1.15, 2.26, 1.95, 2.30, 1.38, 1.67, 0.95, 1.76 Here one has a teperature anomaly development: June -0.20 to 2.45, July 1.68 to 1.09, August 1.00 to 1.49, September 0.05 to -0.58, which looks QUITE different. I know this is no statistically sound argument...but just look at the values - it very much seems that the temperature values in the Gyda region rose rather quite, quite above average. Closing down stations in such a situation seems similar to stop measuring with a clinical thermometer when the fever gets high! Hello? The link at http://meteo.ru/climate/sp_clim.php is broken and the other link at http://meteo.ru/english/climate/kat600_e.htm (data) seems not to list any of the above mentioned stations. Рис.4. Аномалии температуры воздуха в январе 2008 г. На врезках ряды среднемесячной январской температуры воздуха и среднесуточной температуры воздуха в январе 2008 г. на метеостанциях Марресаля, Анадырь и Усть-Кокса. Be careful when trying to machine read - the file is not in usual csv format and in particular latitudes/longitudes with a minus sign are not even whitespace seperated from a neighbouring tab entry. But at least the stations are all in one file in contrast to the "UK Met Office formatted version of station data" and other sources. There is though nothing in this regard for anomalies, so one would compute them by hand. Nathan, What is the standard for anomaly computing ? temperature in month A minus average over all temperatures in that month in which time interval? Please give me a formula and not a link to some unreadable paper. For the readers convenience I did a fast counting of the above list of russian stations in northern latitudes. there are 61 stations (plusminus 2 for counting error) and 23 stations running until 2011. If this would hold for all russian stations, then this would mean that Russian "closed down" (in the sense of reporting to HADCRUT) two thirds of it's measuring stations! However Russia is still "considerably well" covered with HADCRUT collected measuring stations. That is over time there is an overall deterioration of the HADCRUT measurement values and if the data was sparse already than this deterioration is now really essential. Like there are e.g. meanwhile almost no measurement values in Central/East Africa. And Canada is extremely sparse. What's going on here? Nathan do you know of other global temperature files? Frankly, I am rather shocked about the state of measurements and I am asking myself how modelling should work at all if the data is treated in such a way. Comment Source:I forgot to list the URL for the stations data: http://www.cru.uea.ac.uk/cru/data/temperature/crutem4/station-data.htm File:http://www.cru.uea.ac.uk/cru/data/temperature/crutem4/crutem4_asof020611_stns_used.zip Be careful when trying to machine read - the file is not in usual csv format and in particular latitudes/longitudes with a minus sign are not even whitespace seperated from a neighbouring tab entry. But at least the stations are all in one file in contrast to the "UK Met Office formatted version of station data" and other sources. There is though nothing in this regard for anomalies, so one would compute them by hand. Nathan, What is the standard for anomaly computing ? temperature in month A minus average over all temperatures in that month in which time interval? Please give me a formula and not a link to some unreadable paper. For the readers convenience I did a fast counting of the above list of russian stations in northern latitudes. there are 61 stations (plusminus 2 for counting error) and 23 stations running until 2011. If this would hold for all russian stations, then this would mean that Russian "closed down" (in the sense of reporting to HADCRUT) two thirds of it's measuring stations! However Russia is still "considerably well" covered with HADCRUT collected measuring stations. That is over time there is an overall deterioration of the HADCRUT measurement values and if the data was sparse already than this deterioration is now really essential. Like there are e.g. meanwhile almost no measurement values in Central/East Africa. And Canada is extremely sparse. What's going on here? Nathan do you know of other global temperature files? Frankly, I am rather shocked about the state of measurements and I am asking myself how modelling should work at all if the data is treated in such a way. You can have a more detailled look on what I mean exactly at this blog post on randform. He has date selection so you can see the progression over time. Thanks for the links WebHubTel! Our application had also sofar also some date selection and clickable markers, but I am sofar not so happy with the WebGL earth custom markers, so eventually we will try to change these. So our application will probably still take some time (also for other reasons)...just in case you wanted to see it. One of your links contained a link to a NOAA temperature collection: http://www.ncdc.noaa.gov/ghcnm/v3.php That seems to be worth looking at. If you know about other temperature collections then please let me know. Comment Source:>For comparison purposes, Clive Best has constructed an interactive station browser here >http://clivebest.com/world/Map-data.html >He has date selection so you can see the progression over time. >And Nick Stokes has his variation here >http://www.moyhu.blogspot.com.au/p/blog-page_24.html Thanks for the links WebHubTel! Our application had also sofar also some date selection and clickable markers, but I am sofar not so happy with the WebGL earth custom markers, so eventually we will try to change these. So our application will probably still take some time (also for other reasons)...just in case you wanted to see it. One of your links contained a link to a NOAA temperature collection: http://www.ncdc.noaa.gov/ghcnm/v3.php That seems to be worth looking at. If you know about other temperature collections then please let me know. Meterological stations are densest in places with high populations and strong economies. They're not necessarily located where they would be most scientifically useful. I think all the global temperature records are pretty much different analyses of the same set of stations. The main independent alternative is satellite data (e.g. RSS). Comment Source:Meterological stations are densest in places with high populations and strong economies. They're not necessarily located where they would be most scientifically useful. I think all the global temperature records are pretty much different analyses of the same set of stations. The main independent alternative is satellite data (e.g. RSS). So you say it is not HADCRUT or some communication problem that the number of global measurement stations has been vastly decreasing. Are you sure? It might be that the set used for climate predictions is about the same, it actually looks like that, if I look at this list. But like with what data are the weather predictions made? Meterological stations are densest in places with high populations and strong economies. They’re not necessarily located where they would be most scientifically useful. I might miss some essential facts, but it seems to me that a simple thermometer even together with a little solar powered sender could be even under 100$. The temperature in the HadCrut file is accurate up to the tenth, so a rather cheap thermometer could be used for this. Looking at an online market for automatic weather stations seems to substantiate that suspicion. Setting up and reading out would need some more infrastructure and peoples work, but still -the pure technical device especially for temperature measurements seems to be easily set up and in fact it seems automated weather stations are already somewhat in use. More recently, coverage has reached 90% of the territory in several countries, including Comoros, Kenya, Malawi, Mauritius, Seychelles, South Africa, and Uganda. Other countries that in 2007 reached above 50% of GSM coverage are Botswana, Burkina Faso, Burundi, Cape Verde, Guinea, Namibia, Rwanda, Senegal, Swaziland, and Togo. Химические параметры: CO, CO2, NO2, SO2, O2, O3, H2S, NH3, AsH3, Cl2, ClO2, природный газ, С2H4O, F2, общие углеводороды,гидразин, гидриды, HCl, HCN, HF, меркаптан, метан, фосген, фосфин, и т.д. Метеопараметры: температура и влажность воздуха, атмосферное давление, скорость и направление ветра и т.д. Физические параметры: шум, радиация, электромагнитные излучения, вибрация, перемещение, освещенность и т.д. (it though is a bit more difficult to determine the price of that, like the company just says what the price consists of but not what it is). Comment Source:>I think all the global temperature records are pretty much different analyses of the same set of stations. The main independent alternative is satellite data (e.g. RSS). So you say it is not HADCRUT or some communication problem that the number of global measurement stations has been vastly decreasing. Are you sure? It might be that the set used for climate predictions is about the same, it actually looks like that, if I look at <a href="http://www.ipcc-data.org/observ/clim/ar4_global.html">this list</a>. But like with what data are the weather predictions made? >Meterological stations are densest in places with high populations and strong economies. They’re not necessarily located where they would be most scientifically useful. I might miss some essential facts, but it seems to me that a simple thermometer even together with a little solar powered sender could be even under 100$. The temperature in the HadCrut file is accurate up to the tenth, so a rather cheap thermometer could be used for this. Looking at an <a href="http://www.alibaba.com/showroom/automatic-weather-station.html"> online market for automatic weather stations</a> seems to substantiate that suspicion. Setting up and reading out would need some more infrastructure and peoples work, but still -the pure technical device especially for temperature measurements seems to be easily set up and in fact it seems <a href="http://badc.nerc.ac.uk/view/badc.nerc.ac.uk__ATOM__dpt_1162913493029258">automated weather stations</a> are already somewhat in use. Moreover in densely populated aerea's where the economy is not so good one has probably enough "cheap labour" for simply reading off a cheap thermometer and meanwhile phone coverage is pretty good also areas, which may not so be economically well off, like in parts of Africa, <a href="http://en.wikipedia.org/wiki/Mobile_telephony_in_Africa">wikipedia writes</a>: >More recently, coverage has reached 90% of the territory in several countries, including Comoros, Kenya, Malawi, Mauritius, Seychelles, South Africa, and Uganda. Other countries that in 2007 reached above 50% of GSM coverage are Botswana, Burkina Faso, Burundi, Cape Verde, Guinea, Namibia, Rwanda, Senegal, Swaziland, and Togo. (but <a href="http://www.bbc.com/news/world-africa-27700537">connections might be disturbed for other reasons</a>) Side remark: apart from temperature one could also think about measuring aerosols etc. at some such stations, like <a href="http://moreprom.ru/product.php">this measurement apparatus</a> measures even methane etc. : >Химические параметры: CO, CO2, NO2, SO2, O2, O3, H2S, NH3, AsH3, Cl2, ClO2, природный газ, С2H4O, F2, общие углеводороды,гидразин, гидриды, HCl, HCN, HF, меркаптан, метан, фосген, фосфин, и т.д. >Метеопараметры: температура и влажность воздуха, атмосферное давление, скорость и направление ветра и т.д. >Физические параметры: шум, радиация, электромагнитные излучения, вибрация, перемещение, освещенность и т.д. (it though is a bit more difficult to determine the price of that, like the <a href="http://moreprom.ru/price.php">company just says what the price consists of </a> but not what it is). where of course what's going on in Kamchatka sounds worse. Comment Source:Just for the archive: <a href="http://www.volcanodiscovery.com/earthquakes/quake-info/38225/M5.1-Thu-6-Sep-Ural-Mountains-Region-Russia.html">http://www.volcanodiscovery.com/earthquakes/quake-info/38225/M5.1-Thu-6-Sep-Ural-Mountains-Region-Russia.html</a> <a href="http://www.volcanodiscovery.com/earthquakes/quake-info/151787/M3.9-Mon-24-Dec--URAL-MOUNTAINS-REGION-RUSSIA.html">http://www.volcanodiscovery.com/earthquakes/quake-info/151787/M3.9-Mon-24-Dec--URAL-MOUNTAINS-REGION-RUSSIA.html</a> <a href="http://www.volcanodiscovery.com/earthquakes/quake-info/246077/M4.1-Sat-30-Mar--URAL-MOUNTAINS-REGION-RUSSIA.html">http://www.volcanodiscovery.com/earthquakes/quake-info/246077/M4.1-Sat-30-Mar--URAL-MOUNTAINS-REGION-RUSSIA.html</a> where of course what's going on in <a href="http://www.volcano.si.edu/reports_weekly.cfm">Kamchatka</a> sounds worse. side remark: the island volcano Bardarbunga is rather well documented, as can be seen e.g. by this earthquake visualization (caution: takes rather long to load). Comment Source:side remark: the island volcano Bardarbunga is rather well documented, as can be seen e.g. by this <a href="http://baering.github.io/earthquakes/visualization.html">earthquake visualization</a> (caution: takes rather long to load). the CRUTEM 4 stations data visualization is now online. Caution it takes very long to load. CRUTEM 4 stations data is about 45 MB. Comment Source:the CRUTEM 4 stations data visualization is now <a href="http://nad0815.github.io/climate/tempGlobe/">online.</a> Caution it takes very long to load. CRUTEM 4 stations data is about 45 MB. Gas is released in an area of at least 7500 m2, with gas flares extending up to 25 meters in the water column. There is another thing I would ask into the round here. There is a german radio documentary about gazprom facilities in northern Siberia, around the city of Novy Urengoy which I recently listened to. In that documentary they report amongst others about a preschool where they serve oxygen cocktails, because the "northern air contains less oxygen". I don't know - this cocktail serving might just be a trick to make the preschool more attractive....but may be not. Does someone know about oxygen concentrations in that region? I have sofar found only ocean oxygen concentrations and I don't know however how much this is related to the air surface concentrations. (see also phytoplankton decline)But by looking at an ocean oxygen map (please click on "show figure", I couldnt find a direct link to the map) it looks (?) as if there is actually slightly more oxygen rather than less in some northern regions....however not around the gas fields. In particular if I compare that with the map from 2009 then it seems that ocean oxygen saturation dropped quite dramatically around the gas fields. (By the way: similar things can be reported about some Canadian regions). If air oxygen levels are eventually already generally low then little differences may make a dramatic difference....and the impact on children would eventually (?) be higher than on adults. In that context John, I would like to remind you again of that post. next question: Are there any technological processes with which one could capture the methane releases from permafrost? At least in principle...because of course earth drilling is probably way cheaper for methane exploitation. Comment Source:next question: Are there any technological processes with which one could capture the methane releases from permafrost? At least in principle...because of course earth drilling is probably way cheaper for methane exploitation. I recastlet the above comment now more or less into a randform post. Are the phase transitions of methane hydrates that well understood that one can assert that the high pressure at the bottom of the sea keeps it stable? May be but then may be not. That is what seems to be behind this assertion is that usually the densest water is at the bottom of the sea at 4 degrees Celcius and then you can then look e.g. at this phase diagram http://en.wikipedia.org/wiki/File:Methane_Hydrate_phase_diagram.jpg (where I am not sure how well actually these phases had been studied). But then if there is a lot of bubbling going on, then how well applicable is this diagram? That is I already said here on Azimuth that it may be the case that the tectonics are eventually more active than “passive”. That is I was wondering wether a fault in that region couldn’t be part of “a fault which is a break between the western europe/African plate and the Eurasian/Arabian plate)”. That is if you look at this map on Wikipedia (which is also above in small), then you see that the tectonics along what seems to be the Ural mountains may be part of a (in the map nonexisting) “fault” which goes down to the Arabic fault, i.e. the part between african and arabic plate. The map is from 2002 and I tried to find a more up-to-date image but the server at NASA seems currently down. Above I outlined the plate which you get if you consider that break, where the break through the mediteranian seems also not clear, so that plate might eventually include the african plate. In this context it would certainly be interesting to see wether the recent earthquake in Kathmandu has let to different methane emission patterns than usual....especially in the region around the Ural. Comment Source:>Here the eventual plate, I am referring to Unfortunately I haven't found any recent CH4 tracking images, which are as instructive as those here from 2007: <img src="http://www.esrl.noaa.gov/gmd/ccgg/carbontracker-ch4/images/homepage_movie.gif"> ><a href="http://www.esrl.noaa.gov/gmd/ccgg/carbontracker-ch4/">image caption</a>: CarbonTracker CH4 column average CH4 for July-August, 2007. Warm colors show high atmospheric CH4 concentrations, and cool colors show low concentrations. This sequence shows relatively large emissions from wetlands in Western Siberia and emissions from anthropogenic and natural sources in India and Asia. The resulting high CH4 air masses are then moved by weather systems to form the patterns shown in this animation In this context it would certainly be interesting to see wether the recent earthquake in Kathmandu has let to different methane emission patterns than usual....especially in the region around the Ural. Comparing #85 and #86 I see what you mean about the plate boundary coming down from the East Siberian Artic Shelf to the Urals. I was surprised at the emissions across northern India but comparing th animation with the very hard to see India on the plate map these emissions follow the southern side of an east to west boundary marked in blue across Pakistan to the Himalyas. I don't know what it's called. Comment Source:Comparing #85 and #86 I see what you mean about the plate boundary coming down from the East Siberian Artic Shelf to the Urals. I was surprised at the emissions across northern India but comparing th animation with the very hard to see India on the plate map these emissions follow the southern side of an east to west boundary marked in blue across Pakistan to the Himalyas. I don't know what it's called. Comparing #85 and #86 I see what you mean about the plate boundary coming down from the East Siberian Artic Shelf to the Urals. Well just to make sure: the bronze line was drawn by me into this Wikipedia tectonics image and I have no idea wether this encircled territory is officially considered as a plate, yes not even wether there exists literature on wether one could regard this eventually as a plate etc. The line along the Ural and then furhter south is purely based on observing the plate configurations in the Wikipedia tectonics image, combined together with some other knowledge like that there are mountains, pingos in active regions, and in particular Sunil Vadakkepuliyambatta mentioning "Large fluid leakage structures occurs in SW Barents Sea and shows links to the major tectonic setting." I.e. this is in some sense my considerably speculative interpretation of his "link to a major tectonic setting". In particular as the image caption from NOAA suggests the CH4 blotches around Ural and in India are apparently thought as mostly arising from wetlands in Siberia and India and (other) anthropogenic sources and at least officially not really being also related to tectonical sources, let alone a (maybe not (officially) existing) plate break. So please take this with caution. It's something I think that should be looked at more in depth and no settled wisdom. Apparently the indian plate crashes ("crash" means here in a range of millimeters per year) against the eastern eurasian plate so if there would be a break in the eurasian plate then I could imagine that the crash would be somehow noticable....at least at one point, i.e. one would expect that eventually a shear might be noticable. Comment Source:>Comparing #85 and #86 I see what you mean about the plate boundary coming down from the East Siberian Artic Shelf to the Urals. Well just to make sure: the bronze line was drawn by me into <a href="http://en.wikipedia.org/wiki/Tectonics#/media/File:Plate_tectonics_map.gif">this Wikipedia tectonics image</a> and I have no idea wether this encircled territory is officially considered as a plate, yes not even wether there exists literature on wether one could regard this eventually as a plate etc. The line along the Ural and then furhter south is purely based on observing the plate configurations in the Wikipedia tectonics image, combined together with some other knowledge like that there are mountains, <a href="https://forum.azimuthproject.org/discussion/comment/12057/#Comment_12057">pingos</a> in active regions, and in particular <a href="https://forum.azimuthproject.org/discussion/comment/11788/#Comment_11788">Sunil Vadakkepuliyambatta</a> mentioning "Large fluid leakage structures occurs in SW Barents Sea and shows links to the major tectonic setting." I.e. this is in some sense my considerably speculative interpretation of his "link to a major tectonic setting". In particular as the image caption from NOAA suggests the CH4 blotches around Ural and in India are apparently thought as mostly arising from wetlands in Siberia and <a href="https://forum.azimuthproject.org/discussion/comment/9604/#Comment_9604">India</a> and (other) anthropogenic sources and at least officially not really being also related to tectonical sources, let alone a (maybe not (officially) existing) plate break. So please take this with caution. It's something I think that should be looked at more in depth and no settled wisdom. >I don't know what it's called. In the above Wikipedia image its called Indian plate, but in the context of the earthquake I read (forgot where I think on Spielgel Online) that it belongs to the socalled austro-indian plate (which is encircled in red in the wikipedia image) Apparently the indian plate crashes ("crash" means here in a range of millimeters per year) against the eastern eurasian plate so if there would be a break in the eurasian plate then I could imagine that the crash would be somehow noticable....at least at one point, i.e. one would expect that eventually a shear might be noticable. "It was found that nearly 98% of the earthquakes for different regions, examined for the period 1973-2008, show a direct relationship between the Sun’s position and the earthquake-moon distance together with the Sun-Earth-Moon angle. As the time changes from 00-24 hours, the sum of the earthquake-moon distance and the Sun-Earth-Moon angle changes through 360 deg, and plotting these two variables for different earthquakes reveals a simple 45 deg straight-line relationship between them." For the geometry inclined, that is a stunner. If somehow the guy is ending up just plotting X=X, that would be kind of embarrassing. Comment Source:If you want to see something really wild, take a look at this: New Concepts in Global Tectonics Newsletter, no. 60, September, 2011 SUN, MOON AND EARTHQUAKES Vinayak G. KOLVANKAR Former scientist, BARC, Mumbai 400051, India http://www.ncgt.org/newsletter.php?action=download&id=130 > "It was found that nearly 98% of the earthquakes for different regions, examined for the period 1973-2008, show a direct relationship between the Sun’s position and the earthquake-moon distance together with the Sun-Earth-Moon angle. As the time changes from 00-24 hours, the sum of the earthquake-moon distance and the Sun-Earth-Moon angle changes through 360 deg, and plotting these two variables for different earthquakes reveals a simple 45 deg straight-line relationship between them." ! [eq](http://s2.postimg.org/kg8aaaouh/image.gif) For the geometry inclined, that is a stunner. If somehow the guy is ending up just plotting X=X, that would be kind of embarrassing. If somehow the guy is ending up just plotting X=X, that would be kind of embarrassing. I think there is at least some of that. I do not completely understand the definition of EMD they use, but taking the literal meaning "earthquake-moon distance" it should be a nonlinear measure of the difference in longitudes of the earthquake and the position of the moon in the sky, with some effects from latitude of the quake and eccentricity of the moons orbit. SEM is the longitude difference between the positions of the sun and the moon and GMT of the earthquake is proportional to the longitude diffrence between the quake and the sun. but I would expect his plots to be curved due to the nonlinearity in the EMD to moon-quake angle relationship, assuming I am reading that correctly. Comment Source:> If somehow the guy is ending up just plotting X=X, that would be kind of embarrassing. I think there is at least some of that. I do not completely understand the definition of EMD they use, but taking the literal meaning "earthquake-moon distance" it should be a nonlinear measure of the difference in longitudes of the earthquake and the position of the moon in the sky, with some effects from latitude of the quake and eccentricity of the moons orbit. SEM is the longitude difference between the positions of the sun and the moon and GMT of the earthquake is proportional to the longitude diffrence between the quake and the sun. By basic geometry: sun-quake angle = sun-moon angle + moon-quake angle but I would expect his plots to be curved due to the nonlinearity in the EMD to moon-quake angle relationship, assuming I am reading that correctly. Or am I missing something? GMT of the earthquake is proportional to the longitude diffrence between the quake and the sun. Oops, GMT is the sun-greenwich angle. The sun-quake angle depends on the local time of the quake ..
"Or am I missing something?" Daniel, same here. I was thinking that immediately, lots of people have made the x=x mistake over the years. The tell is usually if the correlation is too perfect. The caveat in all this is that the idea is at least plausible sounding -- that an earthquake is always on the verge of triggering and only needs a slight forcing to trigger. The variation in the G pull is what sets it off. What ought to be done is to get rid of he long "lever arm" of the geometry, if what he is seeing is x+f(x) = x+g(x), get the x's to cancel and then what is left is comparing f and g, not some trend artifact. Comment Source:> "Or am I missing something?" Daniel, same here. I was thinking that immediately, lots of people have made the x=x mistake over the years. The tell is usually if the correlation is too perfect. The caveat in all this is that the idea is at least plausible sounding -- that an earthquake is always on the verge of triggering and only needs a slight forcing to trigger. The variation in the G pull is what sets it off. What ought to be done is to get rid of he long "lever arm" of the geometry, if what he is seeing is x+f(x) = x+g(x), get the x's to cancel and then what is left is comparing f and g, not some trend artifact. In this video Eurasia gets pretty squeezed, but the author thinks Ural stays more or less unaffected. But if there would be a fault then I guess this would look quite differently. Comment Source:a comment to comment 85 and 86 about plate tectonics. Here a link to a video in which a simulation on future tectonics is given: https://twitter.com/galka_max/status/896799828843298817 In this video Eurasia gets pretty squeezed, but the author thinks Ural stays more or less unaffected. But if there would be a fault then I guess this would look quite differently. which is Max Entropy uncertainty on an exponential decline rate. Will cite this. Thanks! Comment Source: Jim, That Omori power law is pretty simple λ=constant/(t+c) which is Max Entropy uncertainty on an exponential decline rate. Will cite this. Thanks! An old friend and flood defence client has recently been in East Timor and Katmandu for the UN consulting on natural disaster mitigation and asked if I could help. In Nepal the recent earthquake triggered overtopping of the current glacial lakes fed by glacier melting so earthquake prediction is the big problem. Do you think there might be some mileage in Kolvanker's lunisolar model for practical prediction purposes? Comment Source:An old friend and flood defence client has recently been in East Timor and Katmandu for the UN consulting on natural disaster mitigation and asked if I could help. In Nepal the recent earthquake triggered overtopping of the current glacial lakes fed by glacier melting so earthquake prediction is the big problem. Do you think there might be some mileage in Kolvanker's lunisolar model for practical prediction purposes? "Do you think there might be some mileage in Kolvanker's lunisolar model for practical prediction purposes?" I thought about that. It's still statistical, but if school children plan recesses around windows of time corresponding to lunisolar phases, it would reduce the probability of being trapped. Or, at the very least, show heightened awareness around those time windows. Comment Source:> "Do you think there might be some mileage in Kolvanker's lunisolar model for practical prediction purposes?" I thought about that. It's still statistical, but if school children plan recesses around windows of time corresponding to lunisolar phases, it would reduce the probability of being trapped. Or, at the very least, show heightened awareness around those time windows. Thanks. That seems like a practical possibility worth considering. Comment Source:Thanks. That seems like a practical possibility worth considering.